- All Single-celled eukaryotes are placed under Protista, but the boundaries of this kingdom are not well defined. - Members of Protista are primarily aquatic. - This kingdom forms a link with the others dealing with plants, animals and fungi. 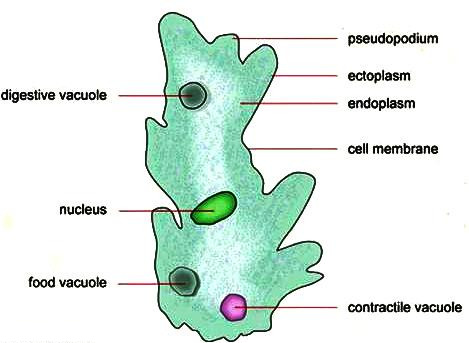 - Being eukaryotes, the protistan cell body contains a well defined nucleus and other membrane-bound organelles. - Some have flagella or cilia. - Protists reproduce asexually and sexually by, process involving cell fusion and zygote formation. - It may be photosynthetic, holotrophic, saprotrophic, parasitic and symbionts. Some have mixotrophic nutrition (holotrophic + saprobic). - The photosynthetic, floating protists are collectively called phytoplankton. - The free-floating, holozoic protozoans are collectively termed zooplankton. 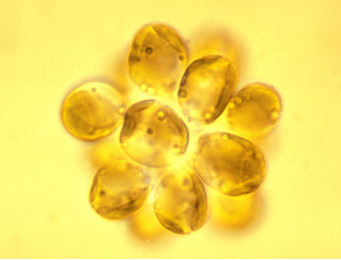 It occurs in some dinoflagellates (Example: ceratium, gymnodinium; von stosch, 1973) and cellular slime moulds. The zygote is 2n that divides by meiosis (also called zygotic meiosis) and produces vegetative cells with 1n chromosome number. These cells divide repeatedly by mitosis and all the resulting daughter cells maintain the 1n number of chromosomes. Some of the vegetative cells produce gametes. When these gametes combine in fertilization, a zygote is formed and the life cycle is completed. This is found in the majority of protozoan protists, diatoms and acellular slime moulds. The organism spends most of its life cycle in the 2n condition. The gametes are only 1n (haploid) that are produced by meiosis (also called gemetic meiosis). The gametes fuse to form zygote that grows to form the diploid individual. This group includes diatoms and golden algae (desmids). They are found in fresh water as well as in marine environments. They are microscopic and float passively in water currents (plankton). In diatoms the cell walls form two thin overlapping shells, which fit together as in a soap box. The walls are embedded with silica and thus the walls are indestructible. Thus, diatoms have left behind large amount of cell wall deposits in their habitat; this accumulation over billions of years is referred to as 'diatomaceous earth'. Being gritty this soil is used in polishing, filtration of oils and syrups. Diatoms are the chief 'producers' in the oceans. Silicon is present in the frustule of diatoms. Auxospones are formed by diatoms. Noctiluca dinoflagellate is called 'night light'. Diatoms are emploid as a source of water glass or sodium silicate. Ganobacteria term was coined by IBCN (1978). These organisms are mostly marine and photosynthetic. They appear yellow, green, brown, blue or red depending on the main pigments present in their cells. The cell wall has stiff cellulose plates on the outer surface. Most of them have two flagella; one lies longitudinally and the other transversely in a furrow between the wall plates. Very often, red dianoflagellates (Example: Gonyaulax) undergo such rapid multiplication that they make the sea appear red (red tides). Toxins released by such large numbers may even kill other marine animals such as fishes. Dinoflagellates reproduce asexually through cell division or by the formation of zoospores and cysts. The cell division starts from posterior end. During cell division, centromeres and spindle are not seen. The spindle is replaced by cytoplasmic microtubules. During mitosis, the chromosomes break up into pairs of chromatids. The nuclear envelops and nucleolus persists during, division. If sexual reproduction occurs, it is isogamous or anisogamous. Two cells conjugate by a conjugation canal where the two amoeboid gametes fuse to form a diploid zygote. Life cycle involves zygotic meiosis (Example: Ceratium, Gymnodinium etc.) or gametic meiosis (Example: Noctiluca). 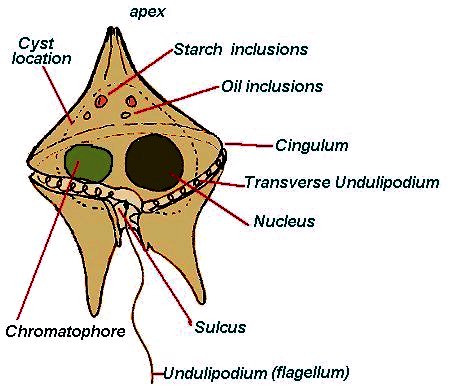 Dinoflagellates, due to spinning caused by activity of transverse flagellum (in cingulum/annulus) and longitudinal flagellum (in sulcus), represent whorling whips. Dinoflagellates with bioluminescence/phosphorescence due to light producing protein luciferin are called fire algae. e.g. Noctiluca, Pyrocystis, Pyrodinium etc. Leeuwenhock (1674, 1675, 1681) was first to observe and sketch protozoan protists including Vorticella and Giardia. Acellular organisms do not contain cellular structure e.g., viruses or not considered as cells but as complete organisms e.g., protists. Wall-less multicellular protoplasm of acellular slime moulds having branched veins and with process of cyclosis are called phaneroplasmodium. Dinoflagellates symbionts in other protists and invertebrates are called zooxanthellae. Some dinoflagellates produce blooms or red tides. e.g. Gonyaulax, Gymnodinium etc. Majority of them are fresh water organisms found in stagnant water. Instead of a cell wall, they have a protein rich layer called pellicle which makes their body flexible. They have two flagella, a short and a long one. The two flagella join with each other at a swelling called paraflagellar body. An orange red coloured eye-spot or stigma is located at the base of flagellum attached to the membrane of reservoir at the level of paraflagellar body. Both paraflagellar body; and eye spot act as photoreceptors and direct the organism towards the optimum light. Though they are photosynthetic in the presence of sunlight, when deprived of sunlight they behave like heterotrophs by predating on other smaller organisms. Interestingly, the pigments of euglenoids are identical to those present in higher plants. Example: Euglena. They contain red pigment astaxanthin. Nutrition is holophytic (photoautotrophic), saprobic (e.g., Rhabdomonas) or holozoic (e.g., Peranema). Even holophytic forms can pick up organic compounds from the outside medium. Such a mode of nutrition is called mixotrophic. 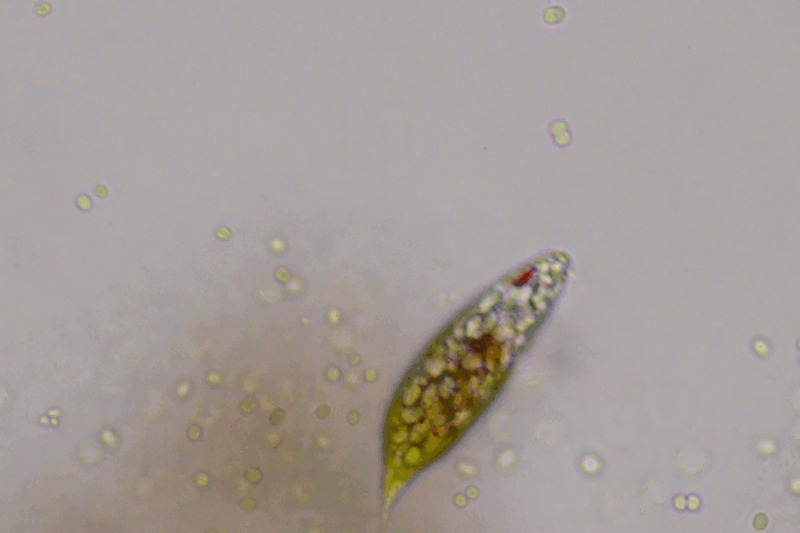 Euglena is a connecting link between animals and plants. Nutrition in Euglena is mixotrophic, when light is available it is photosynthetic, in darkness it is saprophytic absorbing food from surrounding water. Slime moulds are saprophytic protists. The body moves along decaying twigs and leaves engulfing organic material. Under suitable conditions, they form an aggregation called plasmodium which may grow and spread over several feet. During unfavourable conditions, the plasmodium differentiates and forms fruiting bodies bearing spores at their tips. The spores possess true walls. The spores are dispersed by air currents. They are extremely resistant and survive for many years, even under adverse conditions. Acellular slime moulds commonly grow as slimy masses on damp places rich in dead and decaying r organic matter. The somatic phase is diploid and consists of a free, living organic matter multinucleated protoplasm called plasmodium. The plasmodium slowly streams or glides over decaying organic matter putting out blunt finger -like pseudopodia showing -amoeboid movement. They also absorb dissolved organic substances from the substratum showing saprotrophic nutrition. Under unfavourable conditions the plasmodium contracts and gets surrounded by thick horny wall. It is called sclerotium. Each plasmodium reproduces asexually by the formation of several, small, sessile or stalked, brightly coloured sporangia. The multinucleated protoplasm of sporangium is cleaved to produce a large number of small uninucleate spores. The cellular slime moulds occurs in the form of, haploid uninucleated, naked (without cell wall) cell covered by plasma membrane. These cells are called myxamoebae. The myxamoebae move freely with the help of amoeboid movement and phagotrophic or holozoic nutrition. They grow and divide to form a large population of individuals. Under unfavourable condition a myxamoeba secrete a rigid cellulose wall to form the microcyst. Microcyst formation is a means of perennation. Slime moulds possess animal like as well as fungi like character. Euglenoids possess plant like as well as animal like characters. De Bary (1887) classified slime moulds as a animal and called them 'Mycetozoa'. Macbrid coind the term 'Myxomycetes' (Slime moulds). All protozoans are heterotrophs and live as predators or parasites. They are believed to be primitive relatives of animals. (i) They possess flagella for locomotion. (ii) They may be free living aquatics, parasites, commensals or symbionts. (iii) Zooflagellates are generally uninucleate, occasionally multinucleate. (iv) The body is covered by a firm pellicle. (vi) Asexual reproduction is by binary fission. Trypanosome gambiense – The parasite of sleeping sickness. It was first observed by Forde in 1901. Fruce discovered that the parasite of sleeping sickness is transmitted by tse-tse fly. It causes Gambian sleeping sickness. The disease, also called Gambain trypanosomiasis, is found in western and central parts of Africa. Trypansoma rhodesiense - It causes Rhodesian sickness. The disease is also called Rhodesian trypanosomiasis. The parasite is transmitted by the bites of tse-tse fly (glossina palpalis and glossina morsitans). Initially parasite is present in the blood of man but later on it enters the cerebrospinal fluid. Trypanosome cruzi - It causes South American trypanosomiasis (also called Chagas disease). The symptoms of the disease are fever, diarrhea, anaemia and enlargement of lymphoid glands. (i) They develop pseudopodia which are temporary protoplasmic outgrowths. They are of four types- lobopodia (broad and blunt), filppodia (slender, unsupported, independent), axpodia (slender with axial support) and reticulopodia (slender, reticulate). (ii) pseudopodia are used for locomotion and engulfing food articles. (iii) Sarcodines are mostly free living, found in fresh water, sea water and on damp soil. Only a few are parasitic. (iv) The body may be covered with plasmalemma or a shell. Examples: Amoebe, pelomyxa, entamoeba, radiolarians, foraminiferans, heliozoans. Amoeba proteus- The Proteus Animalcule. Amoeba was discovered by Russel Von Rosenhoff in 1755. H.I. Hirschfied (1962) has given a detailed account of the biology of amoeba. It is found in fresh water. Types of pseudopodia are lobopodia. Pelomyxa - It is also known as giant amoeba. The size is about 2.5 mm long. Pelomyxa occurs in fresh water. Nutrition is holozoic. The chief food article is diatoms. Entamoeba histolytica – Lamble (1859) discovered Entamoeba histolytica. Losch (1875) discovered its pathogenic nature. 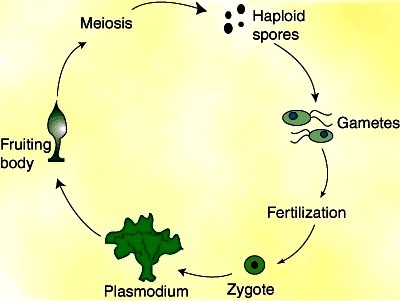 The life cycle of Entamoeba histolytica is monogenetic (single host life cycle). It resides in the upper part of the human large intestine and causes the disease known as amoebic dysentery or amoebiasis. (i) All sporozoans are endoparsites. (ii) Some sporozoans such as Eimeria cause severl diseases like coccidiosis in the birds. (iii) Locomotory organelles (cilia, flagella,pseudopodia,etc. )are absent. 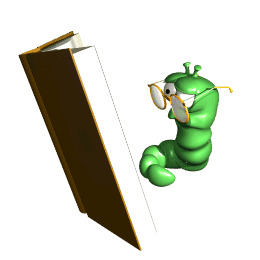 (iv) Nutrition is parasitic (absorptive). Phagotrophy is rare. (v) The body is covered with an elastic pellicle or cuticle. (vi) Contractile vacuoles are absent. (vii) Asexual reproduction occurs through syngamy. (ix) Life cycle consists of two distinct asexual and sexual phases. They may be passed in one (monogenetic) or two different hosts (digenetic). Monocystis: Monocystis live as endoparasite in the coelomic epithelial cells and seminal vesicles of earthworm. The fertility of the earthworm is not greatly impaired, since most of the seminal vesicles are not haemorrhage. (i) Ciliates are protozoan protists which develop a number of cilia during a part or whole of the life cycle. (ii) Cilia are used for locomotion and driving food. (iii) There is a high degree of morphological and physiological specialization. (iv) Most ciliates are free living individuals in fresh and marine waters. A few are parasitic. (v) The body is covered by a pellicle. (vi) Nutrition is holozoic except in the parasitic forms. (vii) there are definite regions for ingestion and egestion. The region of ingestion consists of an oral groove, cytostome (mouth) and gullet. Paramecium- The slipper organism or slipper Animalcule. Paramecium is a free living ciliate which is found in fresh water. 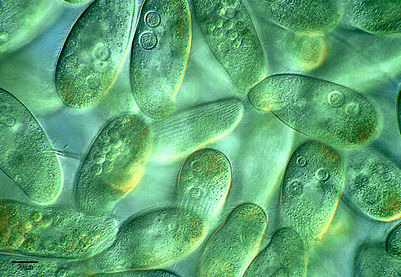 Most widely distributed species are paramecium caudatum and paramecium Aurelia. Nutrition is microphageal. Bacteria are its chief feed. Paramecium is a surface feeder. Pellicle maintains the shape. The cilia of the extreme posterior end longer and form a bunch called caudal tuft. Question5: Which of the following organisms were never included in protista? 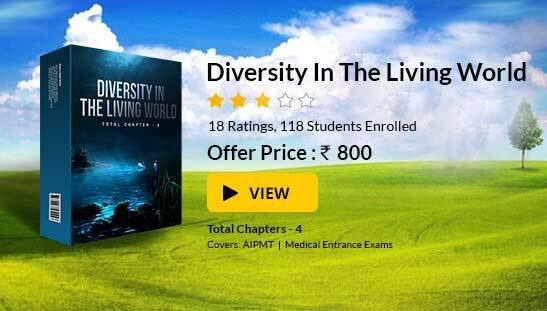 To read more, Buy study materials of Biological Classification comprising study notes, revision notes, video lectures, previous year solved questions etc. Also browse for more study materials on Biology here.